Last week we had a short break in Iceland – ‘short’ meaning just five days. In that time we managed to see some of the island as well as the capital city of Reykjavik where our hotel was located. This post is just an introduction to Iceland with a few of the many photos we took over the week. I’ll post about some of the places we visited over the next few weeks. Well, that’s the plan. 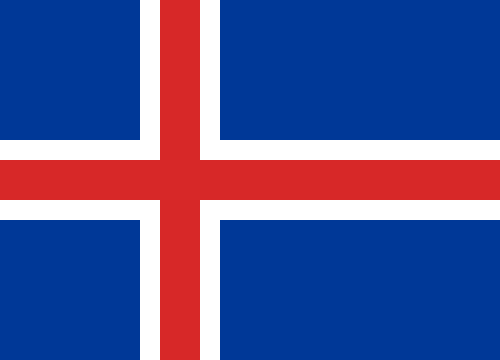 Flag of Iceland. Author: Aevar Arnfjord Bjarmason, Zscout 370 and others. Public Domain. It has a population of 332,529, of which 206,000 – roughly two-thirds – live in Reykjavik, the capital city in the south-west of the island. A map of Iceland showing the major towns, rivers, lakes and glaciers. Translated from a map on the Greek Wikipedia. Author: Max Naylor, 2007. Public Domain. Iceland’s location on the Mid-Atlantic Ridge, dividing the Eurasian and American continental plates, results in the island being volcanically and geologically active and is famous for its hot springs, geysers and active volcanoes. Þingvellir National Park (anglicised Thingvellir) looking from the viewing platform on the North American tectonic plate, across the rift valley to the Eurasian plate. This is the site of the foundation of the Icelandic parliament, which I’ll write about in another post, and is now one of the most popular tourist destinations on the island. There are 130 active and dormant volcanoes in Iceland, eighteen of which have erupted since the first settlers arrived around AD 900. Perhaps the best known ones are Hekla (once believed to be the entrance to hell) Katia and Krafla. And, of course, most people know of the volcanic island of Surtsey – which made its appearance in 1963. Lava fields cover 11% of the land and waterfalls and glaciers can be seen in the highlands. Gullfoss is one of the most spectacular of the many waterfalls in Iceland. Lava fields cover much of Iceland. Short trees are now growing where the soil is suitable. Churches are very varied in Iceland. We were told that in the countryside, some are on wheels so they can be transported to wherever the couple wants the wedding to take place. Isolated farms and houses are a feature across the open land. Left to roam free, the sheep feed on the grasses and herbs, which give Icelandic lamb its ditsinctive flavour. Hot water is pumped from underground to supply much of the country’s heating. Geothermal energy provides roughly 25% of Iceland’s electricity, the rest being mainly from HEP and only 0.1% from fossil fuels. Geothermal energy in Iceland has been used for many years for bathing and washing, as well as for central heating systems in buildings. Pipes also run beneath the pavements in cities like Reykjavik and Akureyri to keep them ice free in winter. Strokkur geyser at Geysir. Strokkur is a very determined geyser and erupts every 5-10 minutes! Geothermal hot water distribution in Reykjavik. Litli Geyser at Geysir geothermal field. Despite Iceland’s latitude close to the Arctic Circle, the general climate of southern, coastal areas is described as temperate, although the high latitude and the influence of the sea keep summers chilly. Inland in the highlands, where the climate is tundra, glacial rivers make their way down to the sea. In winter, nights are extremely long and dark, the only daylight being between 11 am and 4 pm, whereas in summer the nights are bright all over the island. 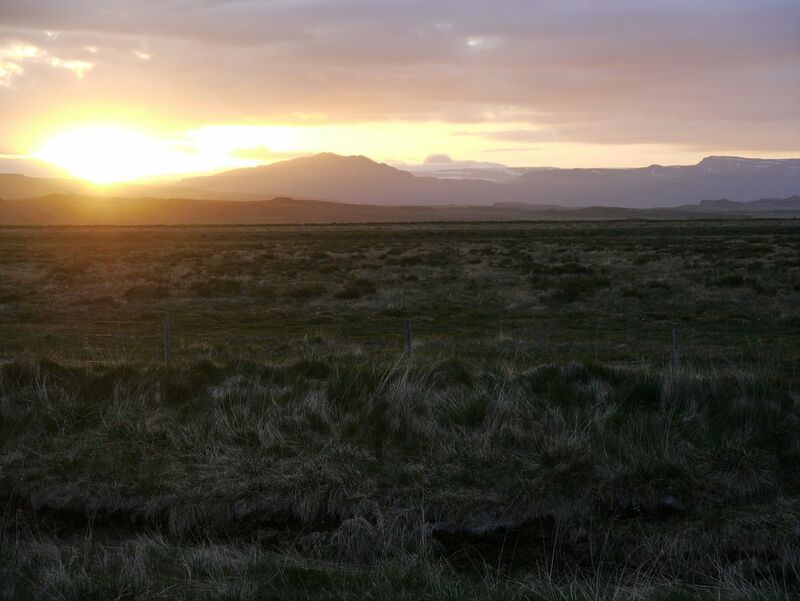 In June the sun never fully sets in the north of Iceland. 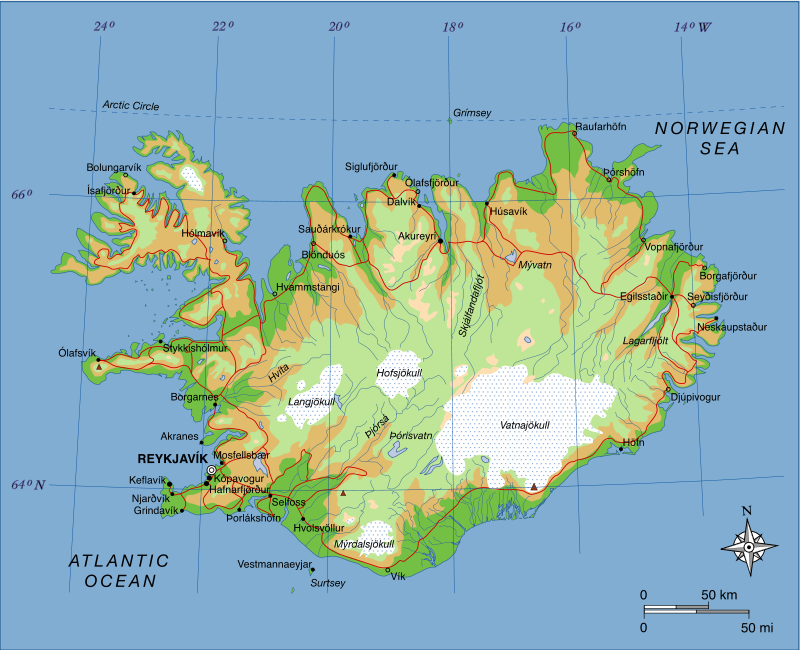 Unlike the rest of Europe, Iceland remained uninhabited until the 8th century. Irish monks came to the islands and, although they left no physical trace, crosses have been found carved into a cave wall. Within a hundred years, Norwegian settlers arrived. These people were thought to be escaping from persecution and economic hardship at home. The official ‘first settler’ was Ingólfur Arnarson in 874. Ingolf Arnarson, the first permanent settler in Iceland. Author: Johan Peter Raadsig (1806-1880). Uploaded by User:Haaukurth. Public Domain. Ingolf Arnarson and his wife Hallveig arriving in Iceland. Photo taken in the Saga Museum in Reykjavig. During the following centuries many Norwegians and a few other Scandinavians settled in Iceland, bringing with them Gaelic thralls (slaves). Icelandic culture is founded on this Scandinavian heritage. The language is descended from Old Norse and is closely related to the Faroese and West Norwegian dialects. 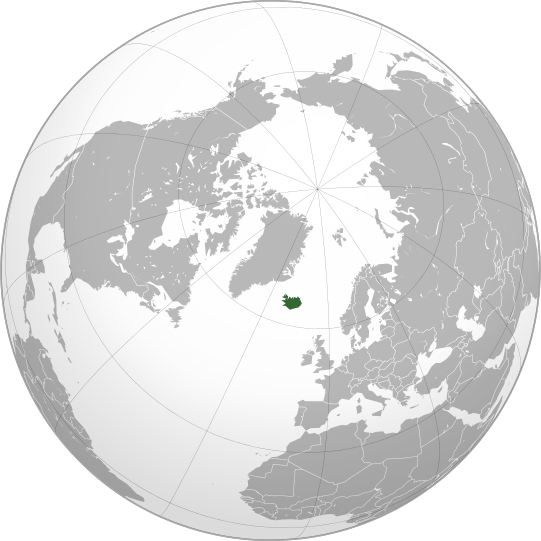 Between 1262 and 1814, Iceland was ruled first by Norway and then Denmark. It became independent in 1918 and a republic in 1944. The monetary unit is the Icelandic króna and if you decide to visit this intriguing country, be prepared to splash out! Iceland is a very expensive place – food/eating out, all alcohol, clothing and other souvenir items are far from cheap. But the island is a fabulous place for anyone interested in geology, the natural world, or history – or a combination of all of these. Whale watching trips are popular, as are boat trips out to see the puffins. Iceland is fast becoming one of the most popular tourist destinations in the world, last year seeing a record breaking number of visitors. This isn’t really surprising as the island has so much to offer in whichever season tourists decide to visit.In the coldest months, winter sports and activities are on offer. We picked September this time simply because of the high chance of seeing the Northern Lights/Aurora Borealis at that time. We weren’t disappointed – except for the fact that we really need better cameras to do justice to the event! Needless to say, our photos of the Lights aren’t very clear – but at least we can say we’ve seen them. 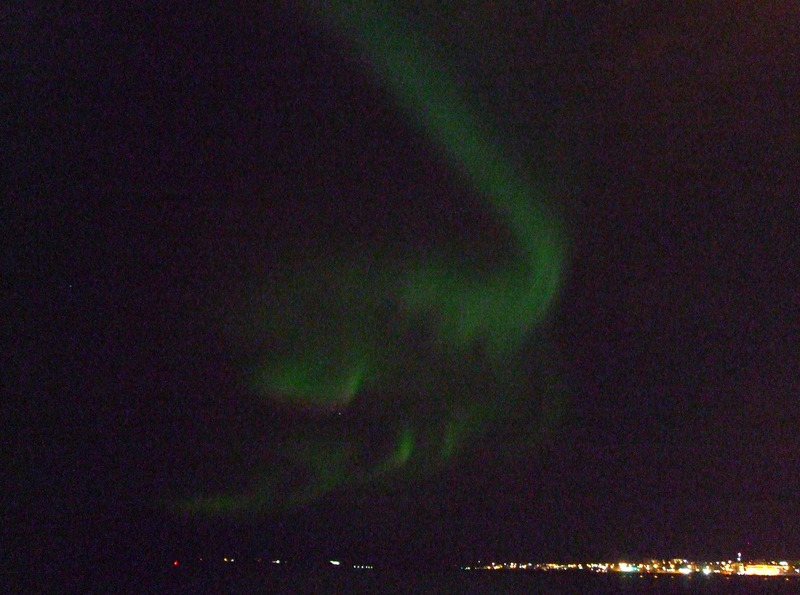 This photo was taken over Reykjavik harbour. To finish with, here are a few photos of Iceland, all but the Icelandic horses taken in Reykjavik. The Hallgrimskirkja. This church dominates the skyline in Reykjavik. A couple of friendly trolls in Reykjavik. Woollen goods are on sale in many places in Iceland. Their designs are quite distinctive. Viking and polar bear in Saga Museum. Polar bears visit Iceland occasionally – generally along the north coast. Main street of Reykjavik at night. Icelandic horses are strong, sturdy but short, but are not referred to as ponies. They were bred on Iceland from breeds fetched over with the original Norwegian settlers. Lovely photo’s this is one place I really want to see. Thanks, Suzanne. It’s amazing how many people long to see Iceland. I’ve wanted to go there for many years. I suppose the fact that it’s on the Mid Atlantic Ridge makes it appealing. There were a lot of Americans there as well as Japanese people. In fact, it gets visitors from all over the world. It’s well worth a visit. Great photos. I have a friend who lives in Iceland. Always encouraging us to visit and will one day. I imagine you have a great long list of places you still want to visit Peggy, even though you’ve already visited so many. I think you must have been born wearing your walking boots. 🙂 We have a long list, too, but we’ll probably only manage to get to a few on them. Hope Santa hears your request. You must go then, Peggy! You really must. I visited my Icelandic friends back in 2008 and I can recommend it! Thanks Freda! Iceland is lovely and there’s so much to photograph. I’d like to visit in June next time when it’s warmer and we can take a dip in the thermal pools. They look amazing in all the brochures. I’m a bit envious, I’ve always wanted to go to Iceland! Absolutely lovely photos. Thank you, Carmen. I’ve no doubt you’ll make it to Iceland one day. There were a lot of American and Canadian visitors when we were there, as well as Brits, Japanese and Scandinavians! Lol. The tourist industry is really growing there, so in a way, I was glad we went now before it becomes totally manic! Looks lovely. My parents went there a few years ago and enjoyed it! Iceland’s really quite unique in many ways. It’s very barren across the lava fields but so much of the scenery is stunning. We really needed another week to see everything we wanted to. There are thermal pools we didn’t get to and other waterfalls and lovely quaint towns. Ah well, another year, perhaps. Thanks Ali. Iceland fascinates so many people, Lynne. Its location on the Mid Atlantic Ridge, the volcanic landscape, hot springs and thermal pools draw people to it – as do the Northern Lights. I’m glad we went and saw it for ourselves. Put me on the list of people who would love to visit Iceland. I have a friend who lives there and posts the most amazing pictures of the wild areas and big, amazing skies on Facebook. Everything you say makes it sound so appealing — except for the prices, eep. The Gullfloss waterfall is gorgeous, and I’ve never seen a geyser. Plus you know I love history museums, and traditional dress has always fascinated me too. You would love Iceland, Joy, and I’m sure some of the scenery could form the background in many future stories, if not your actual novel. If your friend invites you over I’d jump at the offer. I’ve seen photos of lovely skies and they’re mostly from the summer months. June sounds a perfect time to visit to me, although the midnight sun bothers people who have trouble sleeping. The curtains in our hotel were ‘blackout’ ones. I’d just like to get to see more of the island. Five days just wasn’t long enough, but the holiday was a Christmas gift from out two youngest sons, so I’m not complaining in the least! Five days does seem like a short visit for such a huge place, but then, it’s better than zero days! I don’t think I’d be bothered by the midnight sun; I can take a nap in the middle of the day with a blindfold, no problem. And those blackout curtains are great! I’m sure the scenery would be very inspirational. So maybe I should wait to visit Iceland until I’m done writing the current novel and the next two I have planned, because none of them are even possibly set in a region like Iceland. I’d have to add a whole new part of the world — but then, that’s why the other half of the planet is still “to be discovered” in my plans. Lots of flexibility! I also can recommend visiting Iceland. I found February- March was a good time to visit. A bit cheaper, no cruise ship tourists and the winter storms have settled. It is very pretty seeing volcanoes draped in snow and frozen waterfalls. Still, I love winter!!! You might not? Sounds gorgeous to me! For me the main problem with sightseeing in winter is that it’s so hard to get around. I’m big into walking everywhere, and that’s harder in the snow. But then, after a short walk in the cold, I love fireplaces and hot cocoa and marshmallows! If you do go on winter, the footpaths are all ice and snow free, owing to the geothernal energy which is pumped to the houses and shops in pipes under the footpaths. Plus, Rejkjavik doesn’t often get snow, although it was snowing when I was there. Late winter is calmer weather wise. But you won’t have as many clear days for Northern light viewing. Clear footpaths sounds perfect. And I would so love to see the Northern Lights. This country is my list to visit, but when it will happen nobody knows. You presented me with a unique opportunity! Fantastic! Hi Ann. We’ve wanted to visit Iceland for many years, and it’s taken until now to get round to visiting it. You have many years ahead, so you may well get there one day. Iceland is quite unique in many ways, especially the scenery and almost treeless landscape. The short, stubby trees are quite comical to see. It will look very different once they all grow! The aurora borealis is something I’ve wanted to see for many years, Norma. We still plan to do a fjord trip along the coast of Norway sometime, which goes well into the Arctic Circle. Until then, Iceland is a great place to see this awesome event. Watching the lights against the black sky is amazing. They do really move or ‘dance’ about, which photos don’t show at all. I’d love to see them at different times of year, when the colours are very different. Like you, I’ve seem really awesome pictures on the net. Your photos and historical discourse have made me put Iceland on my ‘must-visit’ list. Thank you! Wow, the Northern Lights! I bet it was amazing to be there. How fascinating about the Geothermal energy. I always learn so much from you. I can’t wait to see and read more. Sounds like a wonderful trip! I can’t believe how lucky you were to see the Northern lights during your short visit, Millie! So jealous!! But then it looks like you were blessed with great weather, so I am sure that helped! And I see you visited Thingvellir! Did you walk between the rift? And I have a photo that must be taken from almost the same angle as you at Gullfoss which in winter and on a windy day must be one of the coldest places on earth…well at least in terms of one that I have visited. Lol. My Icelandic friend told me that for summer holiday activities, most Icelanders rent a cabin somewhere and plant trees!! Wonderful idea. But I am a lottle disappointed you thought it was too cold to try the thermal pools in September!!!! They weren’t boiling hot in February when I dipped myself in the blue lagoon surrounded by snow!!! It was so hot!! Ah well ….next time. You are lucky you are only 2 hours from there by plane! Looks like a fun trip! Lucky you for seeing the Northern Lights! That must’ve been amazing! Seeing the Northern Lights was amazing but, unfortunately, our photos don’t do the spectacle justice. The lights ‘dance’ across the skies, moving and twisting, and joining up with each other from all directions. They really need to be on video! How interesting, Cybele. It must be fascinating to have a DNA test done. I intend to have one done myself one day. As for your results, I’m not surprised that Norse showed up in them. Norwegian ‘Vikings’/travellers settled in both the northerly areas of Scotland as well as in Ireland, most notably around Dublin. Most people with roots anywhere in the British Isles often have very surprising DNA – especially due to all the auxilliary Roman soldiers who settled here – and they came from places far and wide, like Syria, Dacia, Africa and so on. And all that’s before we had the Anglo Saxons, Danes, Norwegians and Normans. We’re certainly a mixed bunch, that’s for sure. Hope all is going well in your new house! Skal! The short holiday we had was a Christmas present from our two youngest sons (last Christmas). The youngest, Chris, has been to Iceland many times on business – in all seasons – and wanted us to see the aurora. I’d love to go back again some time, as well as go out on one of the boats. Most go out to see whales, and there are Viking-style ships for the really brave. Chris tried one of those! Unfortunately, we had so little time and lots of places to visit. Yes, you can book boat trips at those kiosks down near the harbour. Most people who go out say how how good the trips are. I envy you going to Iceland for ten days. There were so many places I’d have loved to get out to. There’s a waterfall near the south coast that visitors can get behind which I’d have loved to have seen. I think it’s called Seljalandsfoss. We visited the Gullfoss waterfall, on the Golden Circle Tour instead. May isn’t that far away now. It will be here before you know it! 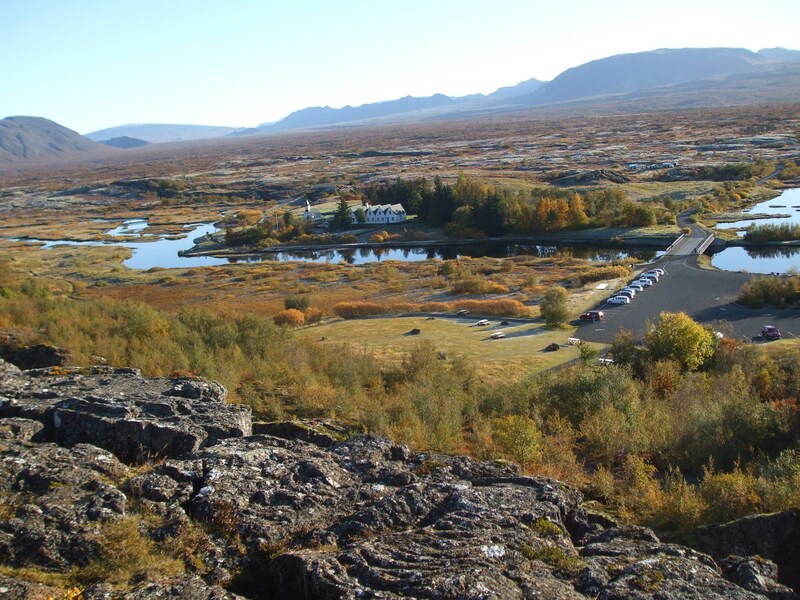 A weirdly wonderful place to visit, golden circle, volcanic landscape, waterfalls waterfalls everywhere, and as a chess player Bobby Fischer’s grave in Selfoss. Yes, Iceland is very beautiful – and definitely weirdly wonderful (in an elves and trolls kind of way) – although we could have done with much more time there. Have you been to visit Bobby Fischer’s grave? I saw on your blog that you’re a chess player, so I imagine you’d head to Selfoss if you visited. One of our sons went to see the waterfall there. It’s one people can get behind. We didn’t make it down there in our short stay. As you say, there are so many waterfalls in the island. Thanks for commenting, Conor. Yes we drove the golden circle, as a slight addendum, we and popped into Selfoss to visit the grave – it was a very odd place for a little church (amidst farm/industrial yard and run down buildings) i left a stone on the pedestal of the headstone (culturally resonant for him, yet he would have probably disapproved), despite him being a wonderful player he wasn’t a nice person(probably because he was mad trying to be charitable) – we drove the south coast, lots of waterfalls, walked behind one, and on to the glacier fields, magical mystical perhaps even spiritual. If I get a chance I shall go again. It sounds as though you had a longer stay than we did. I really want to do the south coast next time we go. I’m glad you managed to visit the grave. As a chess player yourself, I can understand why it meant so much to you – despite the fact that he wasn’t a very nice person. Somehow, that’s a bit sad. Yes, you can feel the mysticism in the landscape in Iceland, and the old religious beliefs and superstitions still linger. As a geologist myself, the landscape did it for me. I went to Iceland a few years ago on a Geography school-trip and absolutely loved it. I really enjoyed reading your post and admiring your photos as it brought back a lot of good memories! Thank you! Sorry I’m late getting back to you but things have been a bit hectic for me this week. School trips are amazing nowadays, aren’t they? I tayght geography and geology for many years, and went on lots of field trips, but they were all around Britain. Going to Iceland must have been great for you. We only had a short break there this time, but I’d love to go again. Iceland is a wonderful island – the volcanic landscape is quite unique. Certainly lots for you to photograph there!